I suppose I have seen the movie “The Rose” many times and each time I know I am watching an unforgettable performance. Seeing it, to me, at least, is like watching someone’s personal life. Bette Midler gives a performance of a lifetime as The Rose, a character based loosely on the life of rock and roll singer, Janis Joplin. She is totally believable as the worn-out, alcohol-abusing rock star who is in dire need of love and a break yet who continues to please her audience as well as her ruthless, money hungry manager played by Alan Bates. After she kicks a drug habit kicking a bad drug habit we watch spiral downward to hit the bottom. We want her to succeed we cheer her on and hope that she leaves rock and rill for a better life. We see that being a diva is killing her but she seems to need rock and roll as much as rock and roll needs her. In the end she gives in and is eaten alive by it. 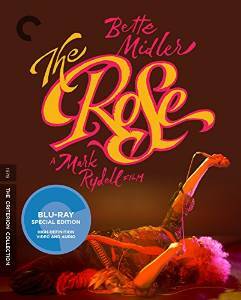 Midler pours herself into the role and when you add a spectacular sidetrack to the film, you get a rare experience about a legend with an “over-the-edge” personality. This is the kind of film that stays with the viewer. This was Midler’s big screen debut and she gives such a performance that we forget that she is just playing the part of Mary Rose Foster. She IS Mary Rose Foster whose romantic relationships and mental health are continuously endangered by the demands of life on the road. There are new special features as well: New 4K digital restoration, supervised by director of photography Vilmos Zsigmond, with 5.1 surround DTS-HD master audio soundtrack, audio commentary featuring director Mark Rydell and new interviews with Bette and the film’s director, Mark Rydell and the cinematographer. There are also archival interviews with Midler and Rydell, with on-set footage and an essay by Paula Mejis, music critic. This entry was posted in Film on February 28, 2015 by Amos.